The Hand Spun Garden scarf was inspired by a request from a customer to make a larger bulky scarf and embellish as I would like. It is a dream moment when a custom order is completely up to the designer to create. It makes the creative juices flow and the thoughts start rolling out ideas and directions to pursue. For the Hand Spun Garden design it was greatly inspired by some wonderful hand spun yarns I had purchase previously. I wanted to save them for a special project as the work and artistry involved in each skein is a work of Art in itself and deserves special attention. This was the perfect moment to use one of my favourite hand spun skeins I had been admiring for months. In this case I used one of my previous designs for the base, the Ruffle Scarf base, but this time I worked it in a hand painted bulky yarn. After finishing several hand spun flowers I felted the design needed another colour to add more interest. Not too much contrast, just enough to add a little more depth to the over all design. Topped it off with some leaves for that garden finish to the design. Currently, I am working on a larger scarf with this base done in a longer slightly wider style and mixed with another scarf that you can wear together or each separately. 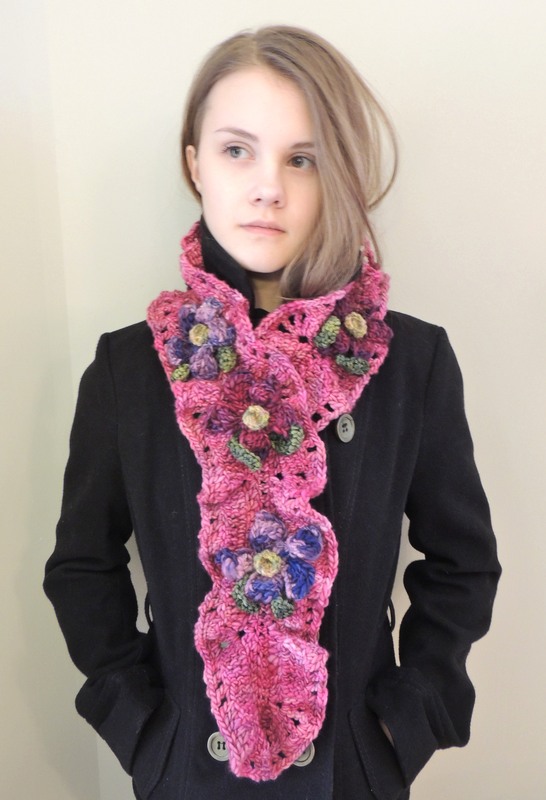 A three in one multi-tasking scarf that can be worn in many different ways. I must run with my ideas in mind and get back to my next project. Have yourself a wonderful day!! Really beautiful! I love those bright colors. This may be a new favorite of mine. You are too kind!! 🙂 Thanks! Thanks Leah. I have been thinking about your beautiful hand spun yarn I bought from you. I will be using that in February sometime. Still deciding how to use it. Just love the colours. What great colors. I was telling my husband this evening how unique your knitted designs are. You must love what you do. Thanks Deb! 🙂 I do love what I do, the best “job” I have ever had! You must love what you do too! I would love it more if I did it faster. LOL! The current stitching project is taking FOREVER.